The shoots develop underground while the surface is stiil frozen, and much of the time, still covered with snow. This is the advent of a new cycle and a new season for the moso bamboo forest which is about a three-hour drive southwest of Shanghai. 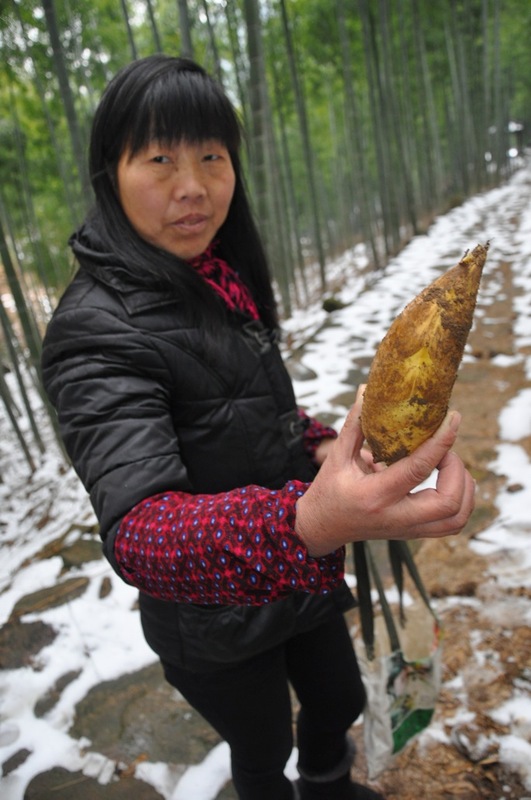 During the traditional Chinese New Year holiday (between January and February), local villagers venture into the surrounding bamboo forests in search of the sweet, tender winter shoots. The journey is always taken on foot with machete and satchel in hand and everyone returns late in the day to share their luck of the day. I have long loved the bamboo forest and the people that work there. I have formed wonderful friendships over the years and my friends have put me on the short list of candidates for the annual bamboo shoot hunts. I usually get the call from Lao Tu and this year it was no different. Lao Tu has worked these bamboo forests for most his 80 years, though he now limits his activities to hikes, quests for wild herbs, and, of course, the winter hunt for shoots. Winter shoots are hard to find and I have spent many a day returning cold and tired with an empty satchel. A shoot can be from six to sixteen inches underground with no indication from above. This is where your bamboo nature comes into play as you assume the character of a bamboo plant, concentrating on where you would send up your shoots if you were the plant. I think of a diving rod in search of water. In earlier years, I would grab my hoe and just dig, mostly around the base of the biggest bamboo I could find, but sometimes just here and there hoping to get lucky. Those were the coldest, hardest hunts for me. Exhausted, I would watch Lao Tu, a man who has studied bamboo for a lifetime. He would spend little time digging. Most of his time would be spent quietly looking and sensing. Finally, he would commit to digging a hole. He would be more often right than wrong when he dug. Locals remember where they have dug in past years and have a knack for sensing new spots in which to dig. They are like seasoned fishermen, knowing just where to drop their lines. Like fishing, success is not guaranteed, and there is a lot of fruitless digging. This is not an Easter egg hunt with a lot of shouting, running around and commotion. The hunters quietly seek their quarry. Only at the end of the day will we know who netted the biggest haul. Once a hunter locates an underground rhizome, he or she will gently dig along it, searching for the prized shoot. Similar to uncovering a vein of ore in a mountainside, there is no telling whether you’ve stuck it big or not. It’s hard work, but despite the labor, a day in the mountain air is refreshing. In the evening, I can usually count on plenty of sweet, tender bamboo shoots and some of Lau Tu’s homemade moonshine for dinner.